Want to see some dolphins? Want to witness some historic sites from the water or see some of Charleston’s most visited attractions? One boat does it all. 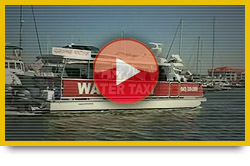 Catch the Charleston Water Taxi for all your transportation and sightseeing needs. The water taxi links Mt. Pleasant (Patriots Point or Charleston Harbor Resort and Marina) and historic Downtown Charleston (Waterfront Park or Aquarium Wharf). You can relax and enjoy views of the new Ravenel Bridge, while dolphins and pelicans feed alongside the boat. The water taxi runs on a continuous loop around Charleston Harbor between Patriots Point and Downtown Charleston from 9am to 8pm. Use it to get to downtown Charleston’s historic Market St, the South Carolina Aquarium, the USS Yorktown (aircraft carrier), or just for a relaxing, scenic harbor boat ride. You can get off the boat and take as long as you wish to tour any of the local attractions. The Taxi runs every hour so you catch any of our hourly boats back to your destination. $12 All Day Pass. No reservation needed. We are also available for private charters. Call for details.